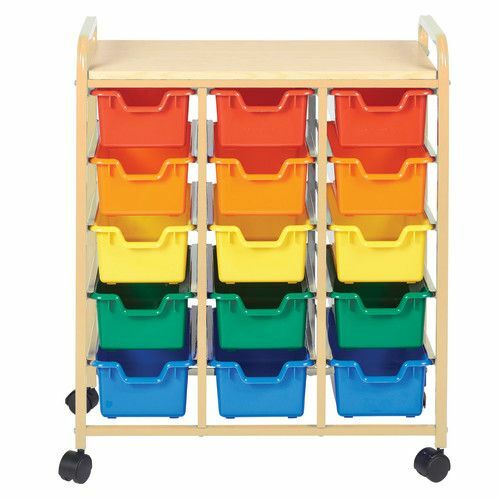 15-Bin Mobile Organizer, Sturdy rack has rounded edges for safety, built-in handles for easy mobility, and cross-bars for added strength and durability. 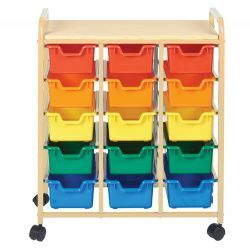 Removable bins keep art supplies, manipulatives, crafts, toys and more stored safely away. Drawer dimensions 11 1⁄2"W x 8"D x 2 3⁄4"H. Units are 131⁄3"D x 33 2⁄3"H x 27 1⁄2"W.